However universal and seemingly timeless spirit is understood essentially to be, the acts of this spirit -- and as a result the "revelations" dispensed to human beings -- deal always with particular persons and particular situations. The outcome of these acts and revelations depends upon the answers which a particular individual, implicitly if not explicitly, gives to the fundamental question: Where do you stand, here and now? The fall of the Berlin Wall was more than just a visible symbol of the death of Communism. It was a defeat for the entire world-system of nation-states and a triumph of efficiency and markets. The fulcrum of power underlying history has shifted. We believe that the fall of the Berlin Wall in 1989 culminates the era of the nation-state, a peculiar two-hundred-year phasde in history that began with the French Revolution. It is well enough that people of the nation do not understand our banking and monetary system, before if they did, I believe there would be a revolution before tomorrow morning. Bitcoin is money outside of government, controlled by the people who become their own sovereignty. Bitcoin will do the nation-state what the printing press did to the church…The use-case as stateless money drives adoption because it’s universally appealing and fills a void every human being feels in their soul: to be free. If a sufficient number of individuals and steady groups with clear purposes can be attuned to these forces of transformation, and courageous enough to focus them into their minds and souls, the day will come for human rebirth. For all practical intents and purposes, Bitcoin is sovereign: it runs by its own rules, and there are no outsiders who can alter these rules. 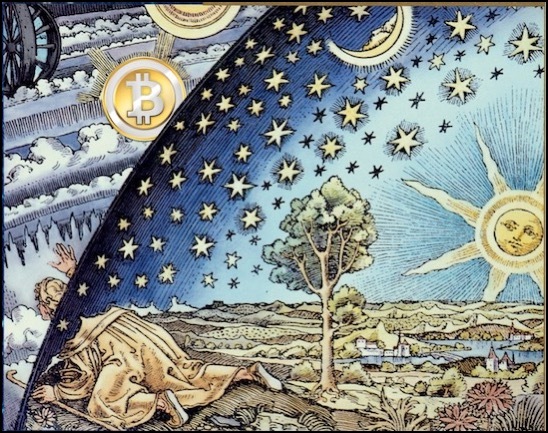 It might even be helpful to think of the parameters of Bitcoin as being similar to the rotation of the earth, sun, moon, or stars, forces outside of our control which are to be lived, not altered. In a noble quest spanning thousands of years, astrologers throughout the planet have taken raw astronomical data and given it meaning through a language of symbolism. When planets Uranus and Saturn are studied as a dynamic pair according to this view, they symbolize the implementation of revolutionary new ideas into human affairs. The new form of electronic money, commonly known as Bitcoin, constitutes such a revolutionary idea. Primarily because of its decentralized peer-to peer-nature and the way it empowers individuals, Bitcoin and the highly disruptive blockchain technology that makes it possible, is challenging the long-held dominance of a global financial elite. Those seeking to moderate that dominance through peaceful, organic means will derive real benefit from the objective perspective astrology provides. According to the ancient astrological adage "as above, so below", objective correspondences exist between celestial dynamics and the human condition. By developing what psychologist James Hillman calls an "archetypal eye", we can relate to these correspondences as maps of consciousness capable of providing us with practical, navigational assistance. This archetypal view proposes that each planet corresponds to a specific psychological function such as core purpose (Sun), communication ( Mercury), emotional adjustment (Moon), physical initiative (Mars), etc. Periodically, all planets of the solar system come into conjunctive-pair-relationships (synod) as viewed from Earth, and when they do, a structurally-predictable cycle of unfoldment begins. The duration of that unfoldment can be precisely mapped using a technique pioneered by the great 20th Century astrologer/philosopher, Dane Rudhyar. 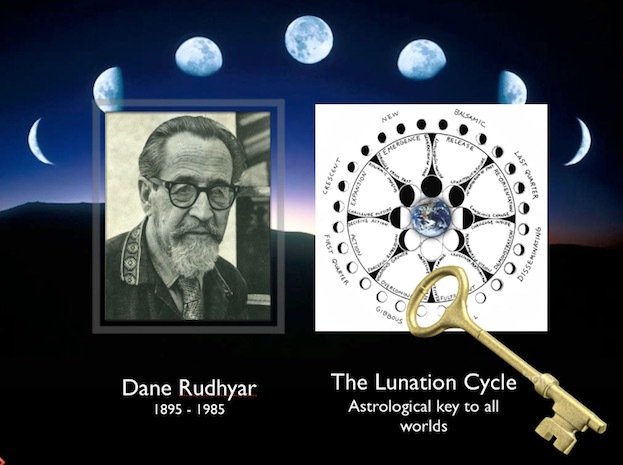 The technique is revealed in his seminal book The Lunation Cycle, where Rudhyar shows the lunation cycle (the changing relationship between the Sun and Moon as viewed from Earth) to be a compelling metaphor for ALL cycles of relationship. Seen as a map of consciousness, it can be used to chart the progression of any cycle of relationship, thus making it a veritable "key to all worlds" capable of revealing the inner psychological dynamics of any planetary pair. 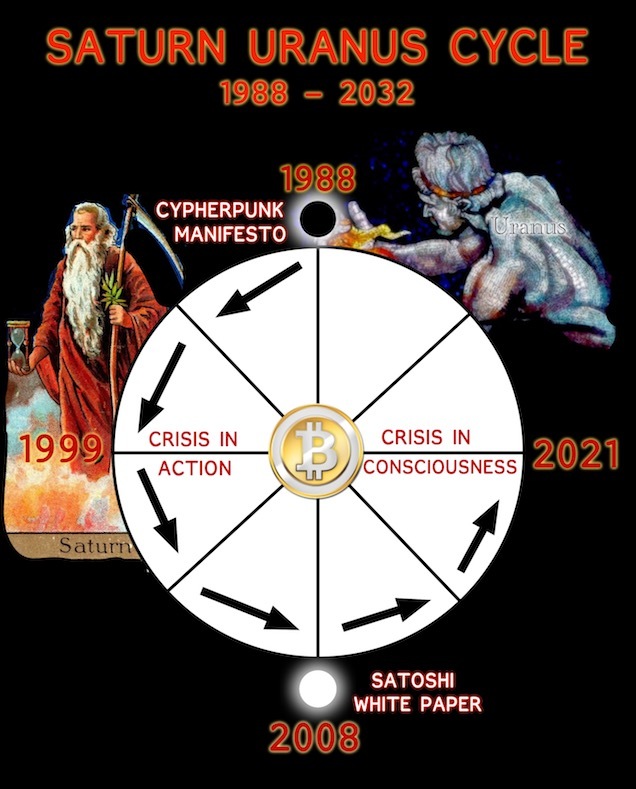 Consequently, it is with this capability in mind, that we now turn to an analysis of the currently-unfolding cycle linking Saturn and Uranus, focusing specifically on the emergence of the Bitcoin/cryptocurrency phenomenon. As will be shown below, the emergence of Bitcoin, from its simple, crypto anarchist origins in the late 1980's, to its current multi-billion dollar market capitalization, has played out in remarkable synchrony to the currently unfolding Saturn/Uranus cycle which, as of 2018, is still 14 years from completion. From an archetypal astrology point-of-view, Saturn/Uranus cycles deal fundamentally with the polarity of freedom (Uranus) versus control (Saturn). Whereas Saturn refers to the stable structures of business, politics, and construction, Uranus deals with revolutions, reforms, upheavals, unusual and unconventional activities. Bitcoin, as the flagship enterprise of the unconventional blockchain technology that makes it possible, presents itself as a powerful alternative to the highly centralized, highly controlled fiat money system at the core of the global military-industrial complex. Fortunately, Bitcoin has challenged the status-quo in a relatively peaceful manner and this bodes well for its continuation. 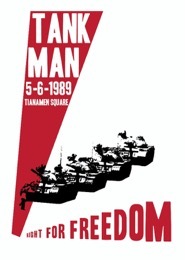 But this is not something to be taken for granted, as was seen in the 1989 Tiananmen Square massacre, which took place shortly after Saturn and Uranus conjoined and where, temporarily at least, the issue of individual freedom vs state control came to an unfortunate conclusion. Above, we see the whole of the current Saturn/Uranus cycle displayed as an eight-sector, lunation cycle mandala revealing a series of distinct keywords for each sector. As I will show below, the rise of Bitcoin and the whole cryptocurrency phenomenon has taken place in synchronization with this series. 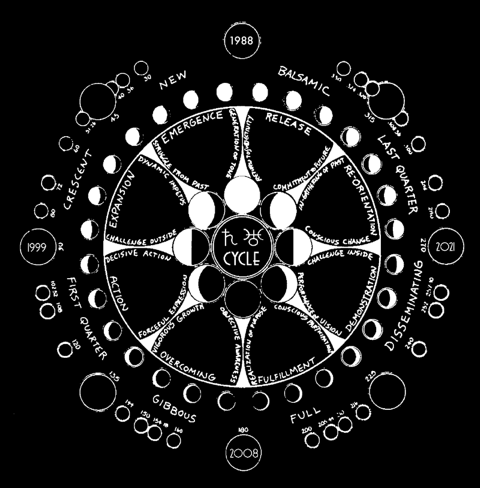 According to the structure of the lunation mandala, the NEW phase of the Saturn/Uranus cycle in 1988 constituted a time when a transfer of seed Ideas into the fertile minds of actual people took place. These were (and still are) ideas, and people, focused on the perennial interplay of control (Saturn) and freedom (Uranus). Two men stand out with respect to this transfer of ideas. One is cryptographer Timothy May who, in 1988, released to a far-flung group of crypto associates, a seminal document titled The Crypto Anarchist Manifesto. Concisely, and prophetically, the manifesto stated a number of unconventional ideas that quickly germinated in the minds of those associates. Among them was Julian Assange who, almost two decades later, founded Wikileaks, an international non-profit organisation that publishes secret information, news leaks, and classified media provided by anonymous sources. His book Cypherpunks: Freedom and the Future of the Internet, co-authored by Jacob Appelbaum and Andy Muller-Maguhn, stands as a compelling amplification of the cypherpunk message. The Crypto Anarchist Manifesto sounded a fundamental tone that continues to reverberate throughout the cryptographic ecosystem. As documented in timeline format below, that ecosystem developed in synchrony with the stages of plant growth mapped by the lunation mandala. Germination of seed within the earth. Seed sprouts, becoming visible above ground. Emergence. Generation of new tone. Struggle from the past. Expansion. Dynamic impetus. leading to a challenge from outside. 1988 Mid-year, Tim May releases initial version of the Crypto Anarchist Manifesto to a small group of associates. Later in the year, the document is distributed to what May called "like-minded techno-anarchists" at the "Crypto '88" conference and then again at the "Hackers Conference" that year. 1988 The Economist features article titled: Get ready for a world currency. The date 2018 is displayed prominently on the cover image. 1989 While working for CERN, the huge particle physics lab in Switzerland, Tim Berners-Lee implements the first successful communication between a Hypertext Transfer Protocol (HTTP) client and server via the internet. This allowed for wide-spread access to the Internet and he is thus credited with inventing what we know as the World Wide Web. 1989 DigiCash Inc., an electronic money corporation, is founded by David Chaum. DigiCash transactions were anonymous due to a number of cryptographic protocols developed by its founder. DigiCash Inc. created eCash as the first anonymous cryptographic electronic money or electronic cash system. It was used as micropayment system at one US bank from 1995 to 1998. 1991 Phil Zimmermann develops PGP (Pretty Good Privacy), an encryption program that provides cryptographic privacy and authentication for data communication. 1992 Eric Hughes operates first anonymous emailer. 1992 Tim May & Eric Hughes start a local cryptography group in Berkeley California.The group becomes known as the "Cypherpunks" and goes online as the open and free, Cypherpunks Electronic Mailing List, with membership of approximately 700 people from around the world. When people signed up, they got a message from Hughes: Cypherpunks assume privacy is a good thing and wish there were more of it. Cypherpunks acknowledge that those who want privacy must create it for themselves and not expect governments, corporations, or other large, faceless organizations to grant them privacy out of beneficence. 1994 Tim May releases the Cyphernomicon to the Cypherpunks Electronic Mailing List. Along with Hughes' Cypherpunk Manifesto, It becomes one of the founding documents of the crypto-anarchist movement. 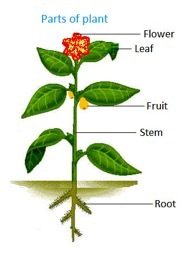 Root and stem develop. Buds form. Challenge outside. Decisive action. Forceful expression. Overcoming. Vigorous growth. Objective awareness. 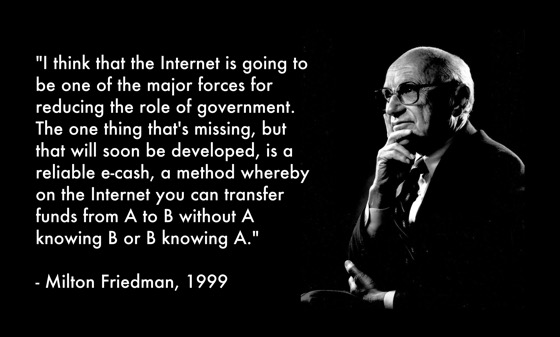 1999 Nobel laureate economist Milton Friedman Ph. D predicts the rise of cryptocurrencies. 1999 Publication of Cryptonomicon novel by American author Neal Stephenson. Concepts dealt with in the novel include anonymous Internet banking using electronic money. Buds open into flowers. Plant bears fruit. Fulfillment. Realization of purpose. Conscious participation. Performance of vision. Challenge inside. 2008 January 21 – Stock markets around the world plunge amid growing fears of a U.S. recession, fueled by the 2007 subprime mortgage crisis. 2008 August 18 - An anonymous person, (or entity) registers the domain Bitcoin.org. 2008 Satoshi Nakamoto (identity unknown) releases the Bitcoin White Paper on Oct. 31, 2008. He writes: " A purely peer-to-peer version of electronic cash would allow online payments to be sent directly from one party to another without going through a financial institution. Digital signatures provide part of the solution, but the main benefits are lost if a trusted third party is still required to prevent double-spending. We propose a solution to the double-spending problem using a peer-to-peer network." 2008 November 4, 2008 - In stunning astrological synchronicity, Barack Obama is elected as President of the United States, exactly to the day of the Saturn/Uranus opposition. Obama goes on to embody and express all aspects of the State, both seen and unseen. 2008 The Bitcoin project is registered on Sourceforge.net, a collaborative community for the development and distribution of open source software. 2009 Satoshi Nakamoto initiates Bitcoin Genesis Block on January 3, 2009. Text embedded in the block references a recent Times newspaper report titled: " Chancellor on brink of second bailout for banks." 2009 Satoshi Nakamoto completes first peer-to-peer Bitcoin transaction by sending Hal Finney 10 BTC on January 12. 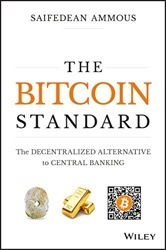 2009 First U.S.–bitcoin exchange rate is published by New Liberty Standard, the first bitcoin exchange site. For one dollar, you can buy 1,309.03 bitcoins. 2009 #bitcoin-dev channel is registered on free node IRC, a discussion network designed for free and open-source development communities. 2010 Bitcoin programmer Laszlo Hanyecz purchases 2 pizzas for 10, 000 BTC in one of the first real-world Bitcoin transactions. The anniversary date of the pizza transaction, May 22, continues to be celebrated by crypto enthusiasts around the world as Bitcoin Pizza Day. 2010 First Bitcoin mining pools established. This puts Bitcoin mining on a larger scale and with it comes the acceleration of mining difficulty. 2010 First mobile phone based Bitcoin transaction takes place. 2010 - 2014 Mt. Gox Bitcoin exchange is established in Tokyo, Japan by Jed McCaleb. Launched in July 2010, by 2013 and into 2014 it was handling over 70% of all bitcoin transactions worldwide, as the largest bitcoin intermediary and the world's leading bitcoin exchange. In 2014 Mt. Gox announced that approximately 850,000 bitcoins belonging to customers and the company were missing and likely stolen, an amount valued at more than $450 million at the time. In February 2014, Mt. Gox suspended trading, closed its website and exchange service, and filed for bankruptcy protection from creditors. 2011 In February of this year, Bitcoin reaches parity with the US Dollar, for the first time in its history. 2011 First Bitcoin conference and World Expo held on August 20th 2011 in New York City. 2011 Wikileaks starts to accept anonymous Bitcoin donations. 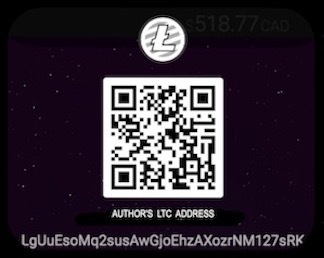 2011 Charlie Lee launches a fork of Bitcoin called Litecoin. He promotes it as "the cryptocurrency for payments." 2011 November 11 - Nakamotorized launches cryptoeducation channel on YouTube. 2011 Bitpay launches first smartphone based Bitcoin wallet. 2011 First Bitcoin app for iPad and iPhones launched. 2012 Formation of the Bitcoin Foundation with the stated mission to "standardize, protect and promote the use of Bitcoin cryptographic money for the benefit of users worldwide." 2012 Bitcoin magazine is launched. The first ever magazine devoted entirely to news matters relating to the digital currency. 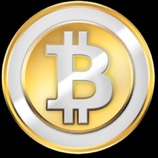 2012 Coinbase Bitcoin platform and wallet service is launched. 2013 Silk Road online marketplace is shut down by law enforcement authorities. 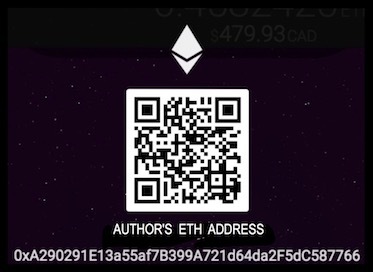 2013 Canadian Bitcoin programmer Vitalik Buterin proposes development of Ethereum, a new platform using a general scripting language. In the following year, a Swiss company, Ethereum Switzerland, develops the first Ethereum software project. 2013 US Senate holds its first hearing on digital currency. 2013 People's Bank of China derides use of Bitcoin as currency. 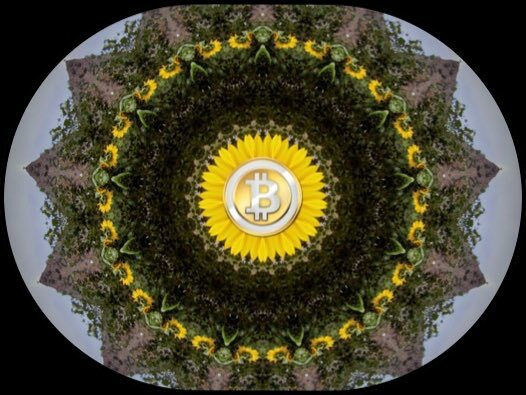 2013 BitCoin Conference in San Jose, California documented in 29 video presentations. 2014 Andreas M. Antonopoulos educates Senate of Canada about Bitcoin. 2014 In December of this year, Microsoft began accepting Bitcoin as a form of payment. 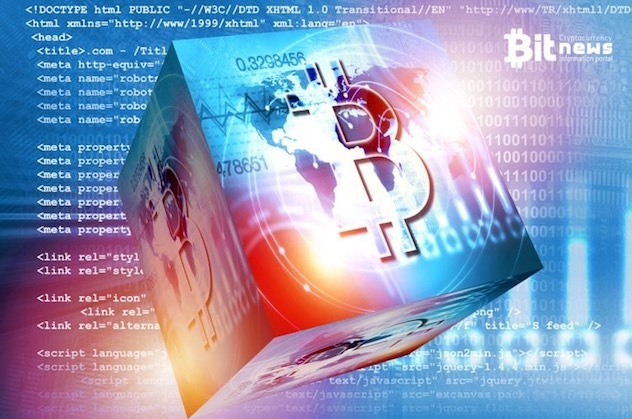 2015 - First scholarly papers directly refering to Bitcoin are presented at the Annual International Cryptology Conference in Santa Barbara, California. The conference has been held annually since 1984. 2016 US President, Barak Obama, speaks on CNBC about encryption and smart phones. He says: : "If you can’t crack that at all, government can't get in, then everybody's walking around with a Swiss bank account in their pocket." Bitcoin evangelist Andreas Antonopoulos counters with "Bitcoin is not a Swiss bank account in your pocket. It is a Swiss BANK in your pocket.﻿"
2017 Donald Trump unexpectedly elected President of the United States. Uranus figures prominently in his birth chart. 2017 Meteoric rise in value of Bitcoin garners massive media attention, both mainstream and social media. Bitcoin closes out 2017 with market capitalization in excess of $250 billion USD and a per Bitcoin price in excess of $15,000 USD. 2017 The revolutionary nature of Bitcoin and blockchain technology is actively promoted worldwide through conferences and meet-ups. 2018 Celebrating Bitcoin’s 9th Birthday: Keiser Report proclaims Bitcoin to be divine intervention that will have a pervasive influence on all aspects of life. 2018 Jan.4: $1 million house is the first to be sold on the blockchain in the U.S.
2018 Jan.18 - 19. The North American Bitcoin Conference, a part of World Blockchain Forum invokes on its website, "The Beginning of a Revolution." 2018 Jan.17. Blockchain Revolution Conference, Seoul, Korea. 2018 Feb.3 CryptoPsychedelic Conference, Tulum, Mexico. 2018 Feb.15 -18. Brought to you by Bitcoin.com, the Fourth Annual Anarchapulco Conference in Acapulco, Mexico, invites us to Make Anarchy Great Again. Speakers at the conference include Ron Paul, Former Congressman, author of 'End the Fed. 2018 Feb. 16 - 18 Bitcoin, Ethereum, and Blockchain Super Conference, Dallas Ft. Worth, USA. 2019 January 3rd - Trace Mayer initiates first annual Proof of Keys celebration. Every January 3rd the Bitcoin community HODLers of Last Resort will participate in a Proof of Keys event by demanding and taking possession of all bitcoins held by trusted third parties on their behalf. This simple exercise proves possession and strengthens network consensus. Companies and exchanges must prove their trustworthiness and consensus. 2019 Feb.14 - 17, 2019 - Anarchapulco in Acapulco, Mexico. Click image or here for larger image. Fruit ripens and falls. Plant withers and dies, dropping seeds to earth. Re-orientation. Conscious change. In-gathering of past. Release. Commitment to future, return to subjectivity. This article is being written in January/February of 2018, still well within the Full Moon to Last Quarter sector of the current Saturn/Uranus cycle. In consonance with the keywords associated with this portion of the lunation map, cryptographic blockchain technology has flowered into fruition with one of its first applications being the creation of the world's first de-centralized digital currency: Bitcoin. Metaphorically, blockchain technology has flowered into human awareness, as Bitcoin. It has also begun production of both seed and fruit. 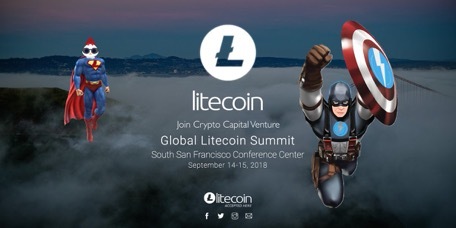 As completely open-source software, it has inspired numerous collaborators around the world, prominent of which is Charlie Lee, founder of Litecoin, a fork of the original Bitcoin protocol. In synch with the flowering phase of the cryptocurrency growth cycle, Litecoin went live on October 13, 2011. Hundreds of other cryptocurrencies have since done the same. For example, Ether is a cryptocurrency whose blockchain is generated by the Ethereum platform which went live on July 30th, 2015. The Ethereum Project is leading the way in development of novel uses of its platform, one example of which is Steamit, "a blockchain-based rewards platform for publishers to monetize content and grow community." It is during this flowering and fruiting phase, that vocal advocates have come forth who are educating both the public and government about cryptocurrency and blockchain technology. These educators include Vitalik Buterin, Andreas Antonopolus, Trace Mayer, John McAfee, Nick Szabo, Roger Ver, Max Keiser and Stacy Herbert,, among many others. Their appearance is completely in keeping with what is called for during the DISSEMINATING phase of the cycle, a phase also carrying the keywords "performance of vision" and "demonstration," referring here to demonstration of the utility and massive reach of this new technology. Numerous conferences and social media channels are fulfilling the dissemination requirements inherent in the current phase of Bitcoin/blockchain evolution. As with all things organic, however, this stage of process will be superseded by a whole new set of requirements if an organic unfoldment, aligned with cosmic harmony, is to be facilitated. According to this approach, it is Inevitable that the prototypical network of relationships spawned by Bitcoin during its first decade will be confronted by opposing forces seeking to bring it down. But just as flowers and leaves must submit to inevitable decay, not so the seed. The seed lives on, impervious to the drama of destruction surrounding it. How will this predictable journey into cyclic decay and deconstruction play out? 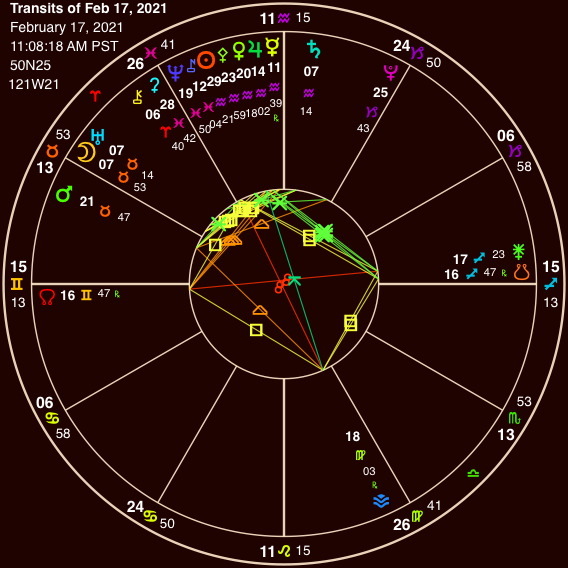 As we approach the Last Quarter Square of the current Saturn/Uranus cycle in 2021, a predictable "crisis in consciousness" is indicated by the lunation mandala. The crisis is planetary in scale, and will thus involve people from all walks of life. It will be especially noticeable in the lives of those who value human freedom and innovation above all else. They will be people who are ever-vigilant about the relentless attempts of governments, banks and industries to coercively dominate and control their lives. Issues of freedom (Uranus) vs control (Saturn) are writ large in the public domain where wide exposure of the corruption of the political establishment and the banking industry has coincided with equally extensive exposure of the mainstream media as the fake news/propaganda machine that it is. Individuals everywhere are waking up to the realization that they have been lied to and seriously manipulated by institutions they implicitly trusted. 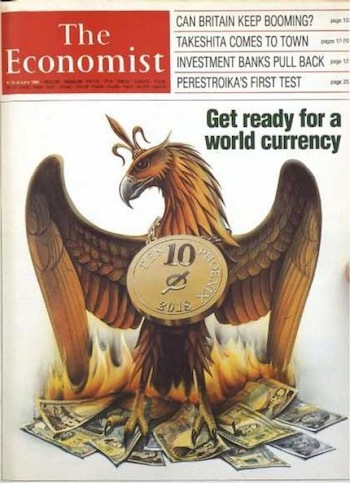 This has precipitated widespread reassessment of the utility of the institutions involved and has placed many people on high-alert regarding attempts by would-be world controllers to enter the blockchain ecosystem in an attempt to subdue it to their ends, whether through overt and forced regulation, or through less obvious means based on false pretenses. This reassessment process is already beginning to manifest as a rising tide of discontent and revolutionary fervour amongst thousands of people worldwide. They are people who have been deeply moved by the spirit of freedom at the core of the blockchain revolution and whether or not they will continue to manifest their dreams peacefully depends largely on how each of them views the transformation of values now underway. For those aligned with a peaceful approach, an astrological perspective can be very helpful. For, from a celestial point-of-view, the overarching crisis of the moment is simply yet another phase in the ongoing series of phases of the Saturn/Uranus cycle playing out harmoniously in the sky. The vision I am sharing here rests on the belief that conscious, deliberate and sustained attunement to that cycle will empower people to peacefully incorporate its natural harmony into their everyday lives, thereby fulfilling the ancient astrological adage "as above, so below". Astronomically, the orbital domain of Uranus is transcendent to, yet inclusive of, that of Saturn. For those who value freedom, and in terms of the Last Quarter Square crisis mapped by the lunation mandala, this translates as a need to discern exactly what limiting beliefs and restricting forms (Saturn) must be let go of in order to move on into expanded consciousness and greater freedom (Uranus). Passage through this Last Quarter to Conjunction quadrant runs from 2021 to the end of the cycle in 2032. It begins with a collective crisis in consciousness and ends with a gradual return to subjectivity. Numerous applications of blockchain technology deliberately meant to fool people will be produced during this time. They will be steeped in glamour and will often be of enormous scale, and this is where the discernment and re-orientation characteristic of the seed is so important. Just as in autumn we see a spellbinding riot of colour and texture within the mass of decaying matter, the seed remains unglamored and serene, confident of its purpose, which is to concentrate within itself, nothing but the essence of the cycle now coming to completion. Consequently, only those blockchain applications that exemplify a truly decentralized character, harmoniously integrating the principles of freedom AND control, are to be considered to be seed for the next cycle of incarnation. As such, and owing to their globally distributed nature, they will hold promise of a liberating foundation of values upon which a truly free humanity can arise. The Last Quarter Square phase of the current Saturn/Uranus cycle comes exact on Feb.17, 2021 with a massing of planets in Aquarius. Especially notable for that precise moment is the fact that the Sun will be located at the final degree of the sign. 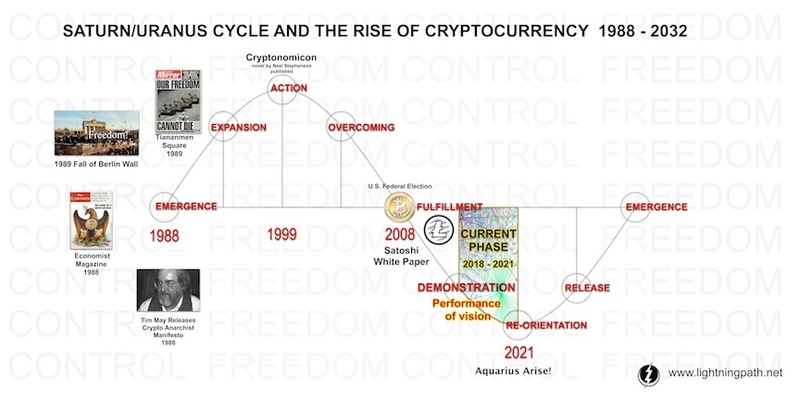 This signals a significant moment of consolidation of Aquarian values like those promulgated by such Aquarian crypto-visionaries as Vitalik Buterin, Roger Verr and Max Keiser. With such obvious resonance to the crypto-celestial dynamics of the current Saturn/Uranus cycle, what better day than this for seed men and seed women from around the world to convene in consciousness to begin, together, what promises to be a challenging and exciting descent into the final twelve years of the cycle? Bitcoin 2013 Conference video playlist. Andreas Antonopoulos: What is the Blockchain?